Roses have been providing colorful displays, rich fragrances and beautiful cut flowers for years. They are exceptionally versatile, useful and will bring years of beauty to your home and garden. These roses are considered the ‘Royalty’ of the rose family. They are known for their large pointed buds and long, strong stems. Hybrid teas are the classic long stem rose. They are ideal as a cut flower, either alone or in an arrangement. Regular deadheading is recommended for best bloom. They are similar to the hybrid roses and bear large, hybrid-tea like flowers with the same form, but with cluster of blooms on each stem. They are tall, hardy and vigorous. Grandifloras have shorter stems than hybrids, but still make good cut flowers. They can easily be used for creating a mass of color in the landscape. Regular deadheading enhances performance. This is now the second largest class of roses. They are shorter-growing than the hybrid teas, and bloom heavily, producing clusters of flowers from late March till frost. Their flowers tend to be smaller than hybrid teas. Their lower heights make them ideal for walkways, borders, or in a bed with other roses such as hybrid teas and grandifloras. Periodic trimming keeps them at their best. These are a cross between old and modern roses popularized by David Austin. Designed to be massed together they offer a charming old-fashioned form and rich fragrance. Miniature roses are perfectly scaled, smaller versions of full-sized roses. They are almost always propagated and grown on their own roots, making them extremely winter hardy. They require more frequent watering, as their roots are smaller and not as deep into the soil. A general rule for fertilizing miniatures is a third as much, twice as often. They grow 6″-36″ tall, and are ideal in containers, rock gardens or as edging plants. This type of rose has flourished in popularity over recent years because of their hardiness and carefree maintenance. Shrub roses bloom profusely during the growing season and require minimal winter protection. Perfect for low borders, hedges and foundation plantings. Occasional trimming in late summer and winter is usually enough for these hardy plants. 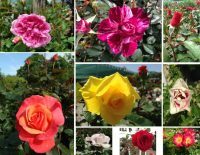 Flower Carpet roses are ideal for borders. Be sure to leave sufficient space for these hardy, heavy bloomers. Exceptionally hardy, spreading roses that quickly cover large spaces. Ideal for slopes or anywhere you want low-growing color that’s attractive and practically carefree. All roses require full sun (at least 4-6 hours per day). Locations that receive early morning sun offer good protection against mildew. Roses need well-drained soil. Good soil additives, like forest compost and peat, are ideal. Use 1/3 additive and 2/3 soil for your planting bed. The hole should be dug twice as wide and 1 1/2 times as deep as the root ball of the rose. Build a mound of soil in the hole to support roots and to hold the plant at the proper height. The bud level should be at above the soil line to protect from rot. Fill soil around roots and water thoroughly. Apply 2-3 inches of mulch to conserve moisture and prevent weeds. During spring and fall roses should receive 1/2 gallon of water per day and 1 gallon a day during the hot summer days! Water roses well before going into winter. Use of a soaker hose is highly encouraged. These work by getting the water to the plants where they need it most, (the roots) and keeping the foliage as dry as possible. If you do water from above, do so early in the morning so the foliage has a chance to dry. This will discourage fungal diseases. Fertilize when roses begin to leaf out in the spring, around March 15, and again in mid-June. Water thoroughly after each fertilization. Do not fertilize after mid- August in this area. The first major pruning is done in spring when the last hard frost has passed. You will want to remove dead or diseased wood and any weak, damaged, or crossed branches. This should leave you with three to four healthy strong canes pencil size or larger. Make sure all cuts are done on an angle so water will run off canes instead of sitting on top. If you prune well in the spring, you may not have to prune too much the rest of the season. Deadhead hybrid teas, grandifloras and floribundas during the season. This is when you cut a finished bloom 1/4” above a fifth leaf on the outside of the cane. You will want to stop pruning by mid-September.